When lenity and cruelty play for a kingdom, the gentler gamester is the soonest winner. 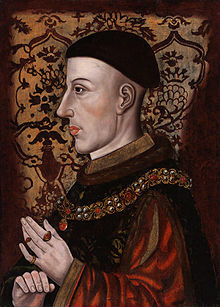 Henry V is a play by William Shakespeare based on the life of King Henry V of England. 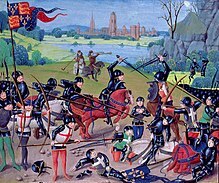 It deals with the events immediately before and after the Battle of Agincourt during the Hundred Years' War. 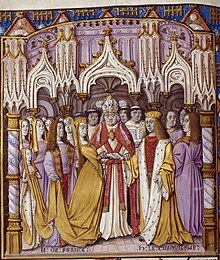 The play is thought to date from the first few months of 1599 and is the final part of a tetralogy, preceded by Richard II, Henry IV, Part I and Henry IV, Part II. And whipp'd the offending Adam out of him. The air, a charter'd libertine, is still. Shall strike his father's crown into the hazard. Base is the slave that pays. Sure, he's not in hell; he's in Arthur's bosom, if ever man went to Arthur's bosom. 'A made a finer end, and went away, an it had been any christom child; 'a parted even just between twelve and one, even at the turning o’ the tide: for after I saw him fumble with the sheets, and play with flowers, and smile upon his fingers' ends, I knew there was but one way; for his nose was as sharp as a pen, and a’ babbled of green fields. As cold as any stone. Stiffen the sinews, summon up the blood. And sheath'd their swords for lack of argument. Cry — God for Harry! England and Saint George! I would give all my fame for a pot of ale, and safety. Men of few words are the best men. Till in her ashes she lie buried. Enlink'd to waste and desolation? When down the hill he holds his fierce career? Of deadly murder, spoil, and villainy. What say you? Will you yield, and this avoid? Or, guilty in defence, be thus destroy'd? For when lenity and cruelty play for a kingdom, the gentler gamester is the soonest winner. You may as well say, — that’s a valiant flea that dare eat his breakfast on the lip of a lion. The secret whispers of each other’s watch. Give dreadful note of preparation. Every subject’s duty is the king’s; but every subject’s soul is his own. That’s a perilous shot out of an elder-gun. Had the fore-hand and vantage of a king. O, do not wish one more! And say, "To-morrow is Saint Crispian;"
And say, "These wounds I had on Crispin's day." There is a river in Macedon; and there is also moreover a river at Monmouth;... and there is salmons in poth. An arrant traitor, as any's in the universal 'orld, or in France, or in England. Dear Kate, you and I cannot be confined within the weak list of a country's fashion: we are the makers of manners, Kate. By this leek, I will most horribly revenge; I eat, and eat, — I swear. All hell shall stir for this! A fair face will wither; a full eye will wax hollow: but a good heart, Kate, is the sun and the moon; or, rather, the sun and not the moon; for it shines bright, and never changes, but keeps his course truly. If thou would have such a one, take me: and take me, take a soldier; take a soldier, take a king: and what say'st thou then to my love? Speak, my fair, and fairly, I pray thee. If he be not fellow with the best king, thou shalt find the best king of good fellows. This page was last edited on 22 April 2018, at 20:26.